Directed by Jon Turteltaub, the movie is loosely based on a 1997 book Meg: A Novel of Deep Terror by Steve Alten. The cast also includes Rainn Wilson, Ruby Rose, Winston Chao, and Cliff Curtis. Scheduled to release in the United States and China in August 2018. Trailer for upcoming American monster film Kong: Skull Island, directed by Jordan Vogt-Roberts. The movie is a reboot of the King Kong franchise, and it’s the second film in Legendary’s MonsterVerse. The film stars Tom Hiddleston, Samuel L. Jackson, John Goodman, Brie Larson, Jing Tian, Toby Kebbell, John Ortiz, Corey Hawkins, Jason Mitchell, Shea Whigham, Thomas Mann, Terry Notary, and John C. Reilly. I’m never a fan of Kong. The fact that it’s always in love with a “tiny” albeit beautiful human being never makes sense to me. And that alone makes it difficult for me to like its role. Set that aside Kong in this teaser looks pretty badass. But seems like there’s too much going on… the skull crawlers are fine but there’s giant spiders and killer birds among others. Chinese actress Jing Tian appears as main cast on movie poster but doesn’t feature in the trailer at all. Guess it’s another unnecessary character to please the Chinese film market. May still watch it for Loki Tom Hiddleston though, and Brie Larson looks pretty amazing too. Teaser for Japanese movie Shin Godzilla (シン・ゴジラ), in theatres in Japan this summer. The film is co-directed by Hideaki Anno and Shinji Higuchi. It’s the 31st instalment in the Godzilla franchise and the third reboot by Toho Pictures. The Shin is a play of words which can mean a few things. Officially it’s RESURGENCE in English title, some Asian teasers go with TRUE, social media seems to like it as GOD, while I prefer the simpler NEW instead. It all seems to fit though. 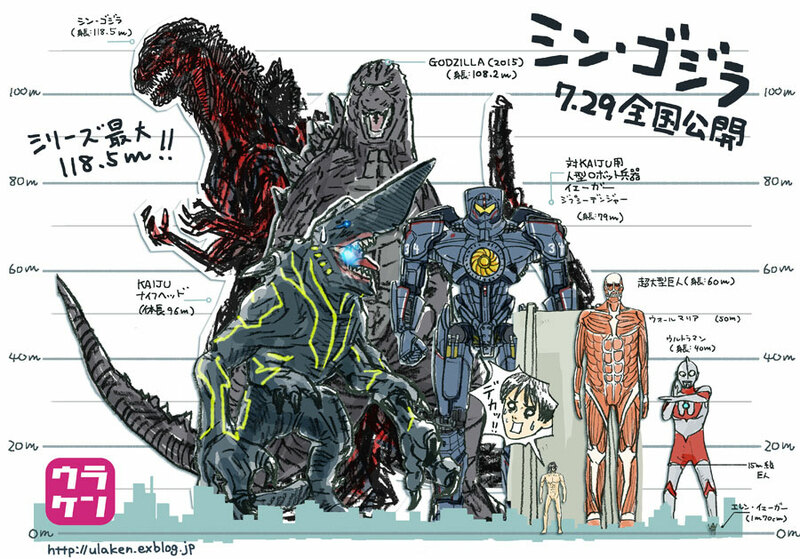 Japanese blogger Ulaken [Jp] has created an interesting illustration comparing the size of the famous giants in Japanese pop culture. The chart features the Godzilla from the upcoming Japanese film and the American one from 2014. The latest Godzilla is the tallest at 118.5 metres. [Update] You can check this post to compare the size of the Godzilla from early to modern days. And then there’s the Jaeger robot and sea monster from the Pacific Rim in 2013. It’s a Hollywood film based on Japanese kaiju (monster) genre. There’s also the gory giants from hit anime franchise Attack on Titan, including the normal and the extra-sized one. They are not really kaiju though. Last but not least, the standard human being who is almost invisible in the picture. Black and white trailer for the first Godzilla movie in 1954. It’s the beginning of a Japanese pop culture icon which is celebrating its 60th anniversary this year. Official main teaser for Hollywood film Godzilla, the third American production (1956, 1998) based on the Japanese Godzilla franchise. In theatres May 2014. The movie is directed by British filmmaker Gareth Edwards. It stars Aaron Taylor-Johnson, Ken Watanabe, Elizabeth Olsen, Juliette Binoche, Sally Hawkins, David Strathairn, and Bryan Cranston. Nice trailer for Hollywood film Pacific Rim, a giant robot vs monster movie (heavily inspired by the Japanese mecha anime/manga genre) by filmmaker Guillermo del Toro, Warner Bros and Legendary Pictures. In theatres July 12, 2013.